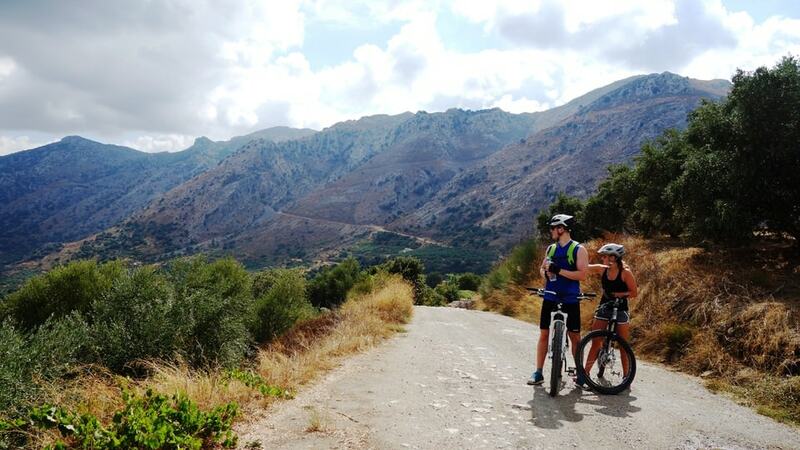 The perfect introduction to Cretan nature and cuisine with an electric mountain bike. Breathtaking views, effortless uphills and safe downhills. Mountain bike tour of medium altitude at the foothills of the Dikti mountains with frequent changes of the landscape and spectacular view. Dominant features are the olive and Skinos trees nad the Dikti massiv. The Impressive Roman aqueduct of Lyttos, the view from the hill of the ancient Minoan city Lyttos, the café stop and the traditional Cretan meal. All the uphills are performed on rural smooth dirt roads. The downhills are performed on asphalt roads. There are short cemented uphill sections of 50-100 meters with grade up to 20%. Included pick up and drop-off from Hotels at Hersonissos, Analipsi, Gouves. The tours distance is 35Km and total uphill is 840 meters.